The United Northern Congress (UNC) is an intergovernmental economic and military alliance between 9 countries, all of which are located in the northern hemisphere of CivClassics, and was formed on the 3rd of August 2018. The UNC operates under a system of collective defense whereby its individual member states agree to mutual defense in response to any attack by any external party. The United Northern Congress prides itself on the democratic values on which it was founded, the congress is comprised of a voting delegation from each contracting party from which all votes, congressional or charter amendments, are decided by unanimous vote by national leaders. The UNC was originally founded by three nations, soon to be joined by six other sovereign entities. The founding states of the UNC were SPQR, Nevrast, Varkonia, with Kaiserreich, Kaltsburg, Bloom, Tvtopia, Gensokyo, and Nyasaland joining later. 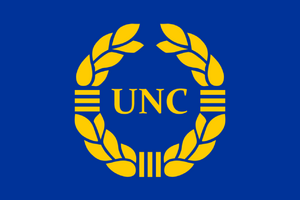 The UNC was founded on the 3rd of August 2018, by SPQR, Nevrast, and Varkonia. This page was last edited on 8 April 2019, at 10:04.